Just when you thought card construction couldn’t get any crazier than Days 1 to 4, it does! Day 5 has cards that light up with circuits and everything. I had seen some tutorials of cards with lights on the internet before and had taken an interest in Chibitronics. So far I had not gone so far as to press the “in my cart” button. That changed today, but that is a story for another day. I decided to make a card that lights up using a small LED light I had gotten in a kit from Papertrey Ink. Finding the little lights that I had stored in a very special place, took about two hours, but finally I came up with them. 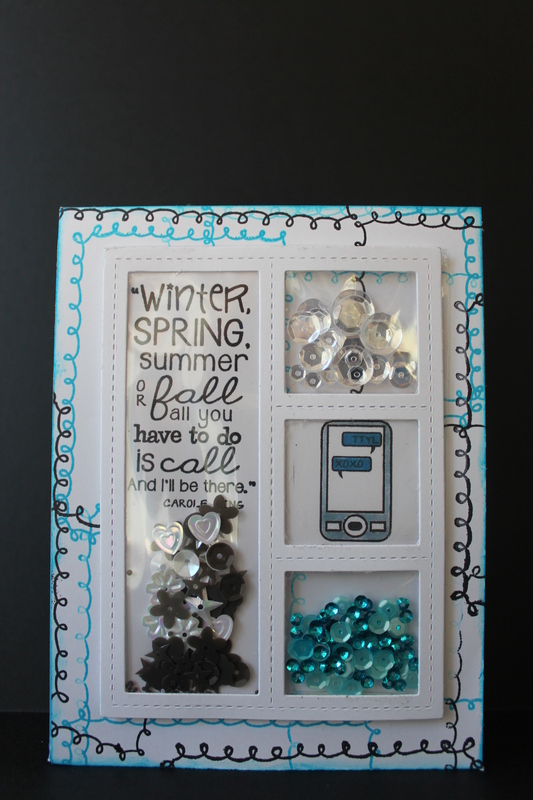 If I were to do this card over again I would have doubled up on the foam tape to make the light more diffused. Generally though, I like the card and you can’t say that the sentiment isn’t “spot on” for the theme. My table is already set for Canadian Thanksgiving tomorrow, but it is the only place with a dimmer switch on the lights! So I am on to Day 4 of the Online Card Class Wild Card. I actually had a practical reason to make a card today. My Grandson Max turned 12 and I needed a Birthday Card for the occasion. He got his own cell phone as his birthday present from his parents. I phoned him to wish him a Happy Birthday and reminded him that Grandma was just a phone call away, should he need me. To emphasize this event and my message, I made him a special birthday card. Now, there are two things wrong with this card. One is, he is probably not aware that phones used to come with curly little cords tying the receiver to the phone base as per my background. The second thing is I am sure he has no idea who Carole King is, or that the sentiment is a quote from the the song “You’ve got a Friend” (James Taylor). No matter, Grandma had fun making it and she means the sentiment. So ok, in the winter he has to call Phoenix, but I WILL be there. I am more than a bit behind in creating cards for the Wild Card Class. They are all fun cards to make, but I wouldn’t be trying to submit them to the Take Ten magazine where the submissions are to take ten minutes or less to make. This card was pretty simple to make because I had the Lawn Fawn pop up die to make the snowy hills and the Lawn Fawn Tree border die to put with it. What took the longest was to colour the Dachshunds. They are often an odd combination of browns that were a bit difficult to blend with the Copic markers. As in the class lesson, I wanted to keep the outside somewhat simple which helps keep the inside of the card the focal point, but I also wanted the outside to be attractive on its’ own. Lawn Fawn Happy Howlidays stamp set, Lawn Fawn Stitched Hillside and Stitched Tree Borders die, Copic markers, Neenah cardstockm Glitter Ritz, Simon Says Stamp Woodgrain cardstock, Imagine Crafts Sparkle spray, My Stik tape runnerm Simon Says Stamp Fog cardstock, Doodlebug Dotted Vellum, Simon Says Stamp Snowflake and Seasons Greetings die, Stampendous Embossing powder, Ek Success Snowflake Border Punch, Zig Two Way glue and Scor tape. I started out making a Christmas card, but was having trouble with the elements not coming together that well. I haven’t abandoned the idea but it needs to marinate for a while. In the meantime, I made this one. Supplies: Papertrey Ink Get Lost stamp set, Papertrey Ink Luggage Tag die, Bo Bunny patterned paper and chipboard, Emerald Creek Buckles and Scor tape.